1. 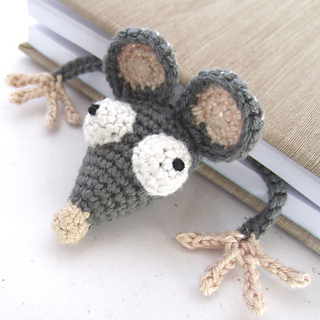 Rat Book Mark - Ok, I think these are beyond cute! The designer also makes other animals as well, but the flattened body with the bug eyes, are just so funny and are sure to elicit a smile from your book loving mom! 2. 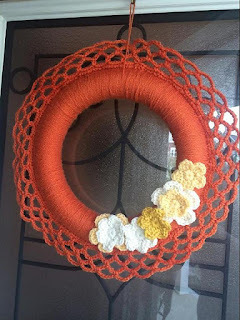 Crocheted Wreath - Moms love to decorate their homes, so a wreath to add to the door would be perfect. This one is in fall colors, but it would be just as beautiful in some spring/summer colors as well. If you did it in yellow it would look like the sun! 3. 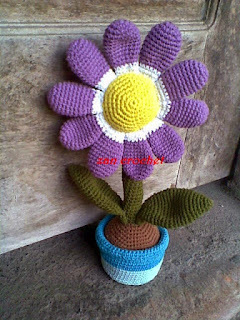 Flower in a Pot - This is cute for a mom to put on her desk at work, or just to bring a little fun decor into her home. And if your mom is like me....it's a flower she can't kill!!! 4. Spa Slippers - These are perfect to just slip on and wear around the house. A lot of slippers these days are really warm but these are perfect for those warmer mornings to to put on and go have your first cup of coffee! 5. 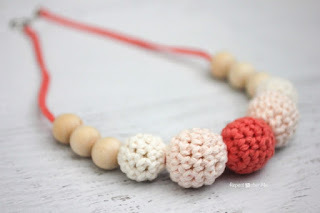 Nursing Necklace - This necklace is great for a new Momma who has a little one. While nursing, the babies like to put the balls in their hands and play with them. It distracts them from grabbing...other things! It's also just a cute necklace for any mom, young and old! 6. 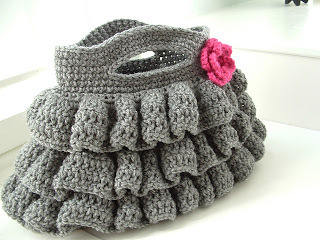 Ruffle Purse - I love purses, and so do most moms. We need a place to put all of our crap that we carry around with us! From diapers to make-up, to money, you name it, we'll have it in our purses. How about this cute bag? You can change up the colors to make it just the way she'd like it. 7. Ying Yang Dish - These bowls are just too cute. They'd be perfect to put on the bedside table for rings, or downstairs to put spare change in. Whatever they'd be used for, they are perfect to organize small objects, and adorable! 8. 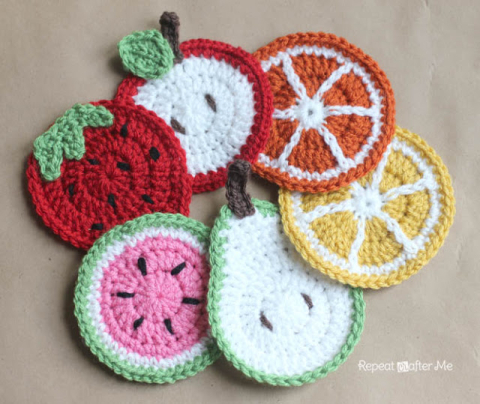 Coasters - There are so many patterns out there for different coasters, but I thought these fruit ones were cute. Moms will be able to use these for all their drinks and to keep their tables free of any of those nasty rings. When people come over they would be great conversation starters too! 9. 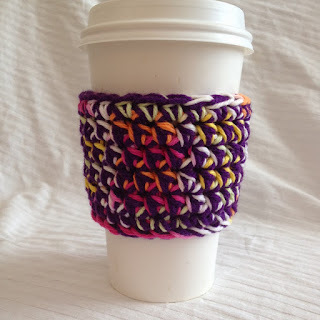 Coffee Cozy - This is great for that Starbucks loving Momma! Made with cotton, you can use different colors or all the same, to give it that unique look your looking for. Keep those precious hands burn free with this coffee cozy. What gifts have you crocheted for your mom before? Would you mom like any of these? I'd love to hear in the comments below! These are SO cute! I love those coasters! 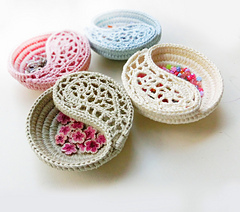 I need to learn to pick up the crochet hook so I can make cute little things for my home soon, because these ideas are to die for. I want to make the coasters for my home too! Everything else just seems to take priority. That bookmark is definitely awesome! oh la la... the crotching mum, you have done it again! I love all of your concepts. Super cute. I could use the cup holder for myself, since Boston is always cold lol But my mum or any mum would appreciate these certainly :) well done! which is your favorite? Aww that's so sweet of you! I'm originally from New England, so I remember that cold weather also!